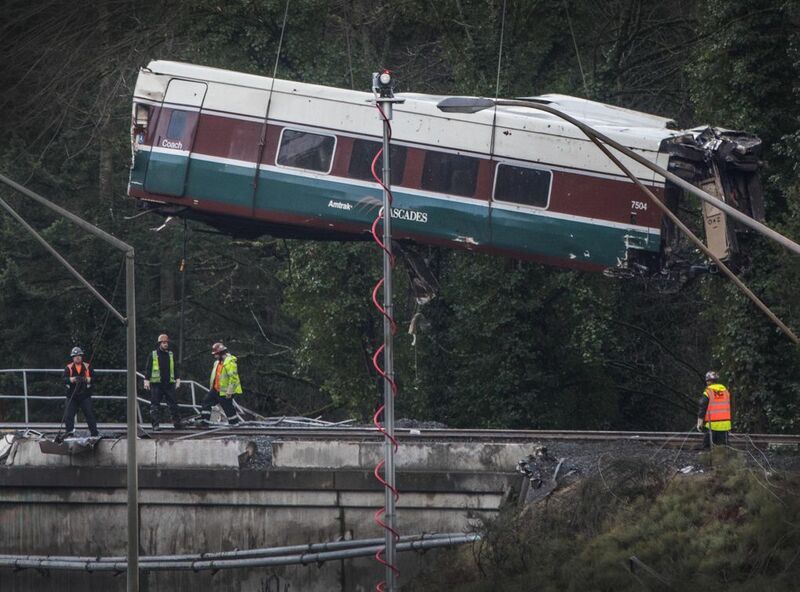 The National Transportation Safety Board, citing the train's data recorder, shared preliminary findings that showed the train was traveling at 80 mph when it jumped the tracks. 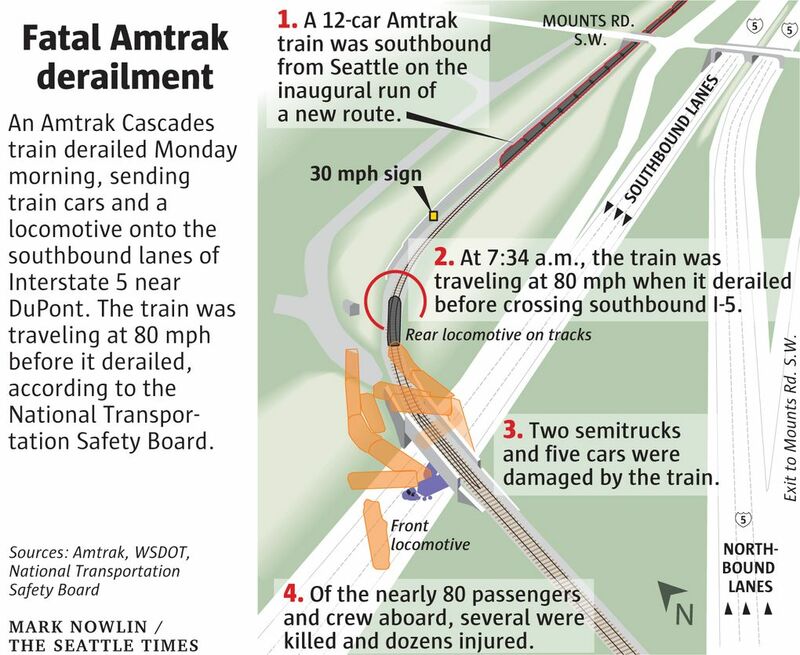 An engineer never applied the emergency brakes before the Amtrak passenger train traveling 50 mph faster than the posted speed limit derailed Monday, killing three passengers and injuring dozens more. Federal transportation officials said Tuesday preliminary information from the data-event recorder in the train’s lead locomotive showed an emergency brake was automatically activated only after the train left the tracks. 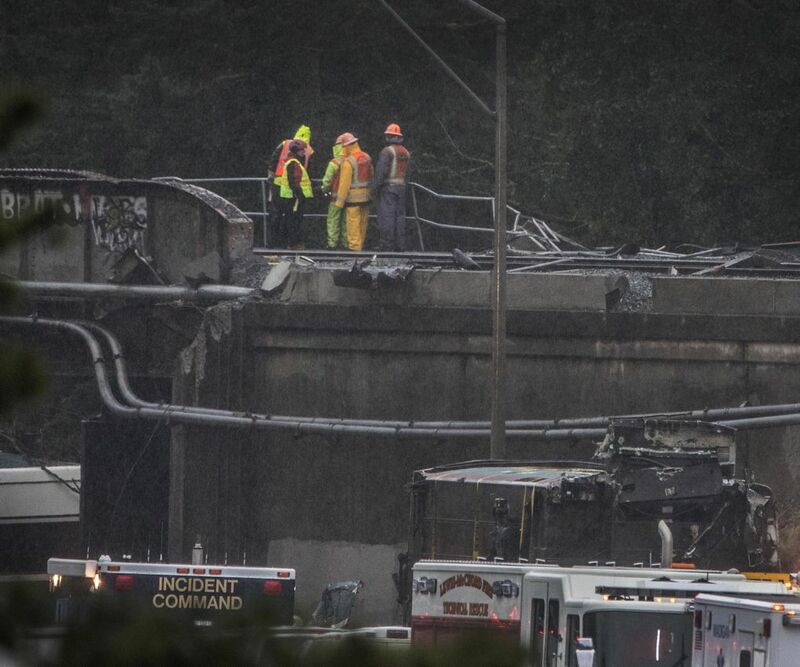 Officials with the National Transportation Safety Board (NTSB) plan to soon interview the train’s engineer and crew members, who were all hospitalized, to help determine why it hit a curve in the tracks at 80 mph, derailing and spilling onto Interstate 5 near Olympia. Zack Willhoite and Jim Hamre, two longtime rail advocates, were among those killed. The identity of the third person has not been released. The Pierce County Medical Examiner will formally identify the deceased, as well as determine cause of death. 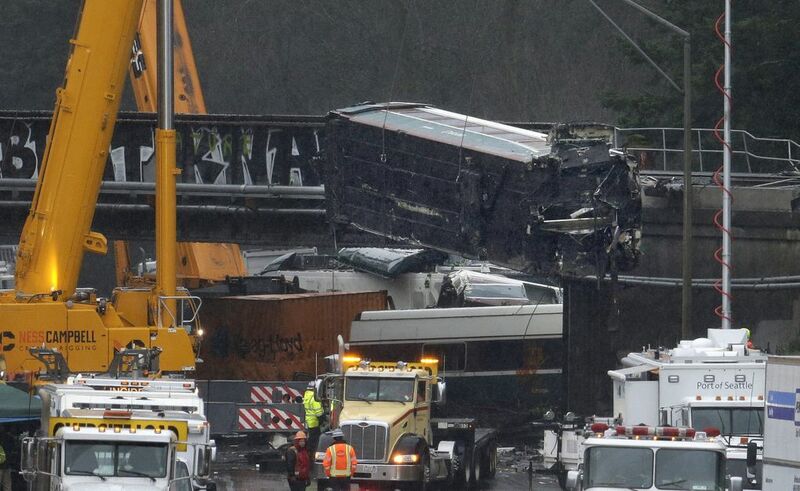 NTSB board member Bella Dinh-Zarr said at a Tuesday afternoon news conference that an engineer and a new conductor who “was familiarizing himself with the territory” were in the cab during the crash. Another conductor was in a train car interacting with passengers. She also said a system that could have automatically slowed the train, known as “positive train control,” was not installed on the train. Dinh-Zarr said data from the train’s recorder showed train was going 80 mph in a 30 mph zone when it derailed. She said it is too early to determine why the train was going so fast, but among the things investigated would be whether distraction played a role. She said investigators were obtaining the train’s inward and outward facing cameras, which would be sent to the NTSB’s lab in Washington, D.C. 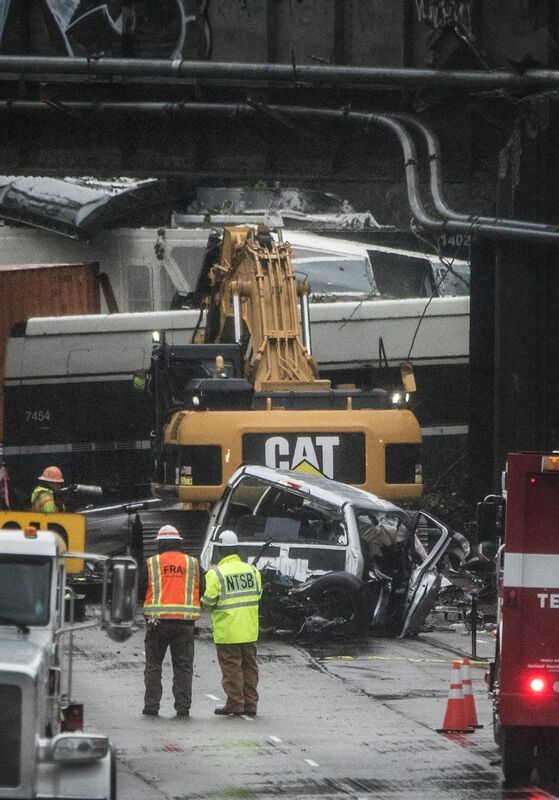 The NTSB, a federal investigating authority, will determine what caused Train 501 to go off the tracks. 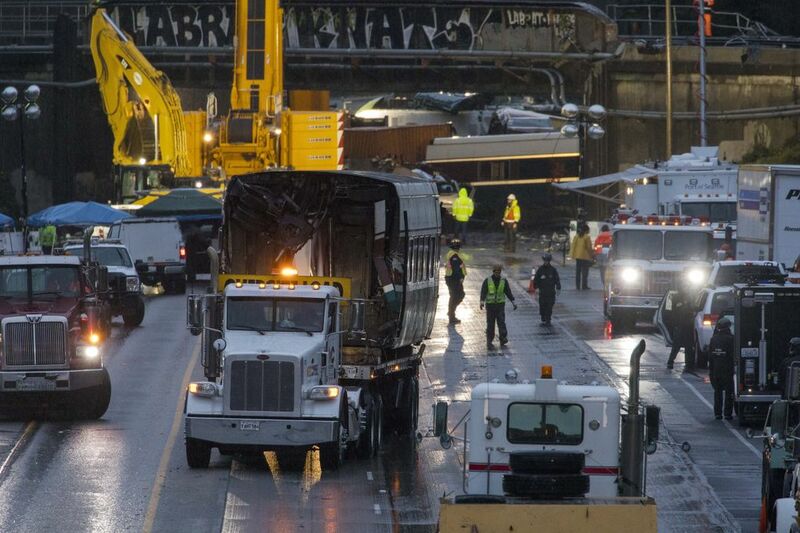 Crews at the site of the crash used cranes Tuesday to hoist the train cars and two locomotives from the railway and surrounding area and load them onto flatbed trucks. The cars are being taken to Joint Base Lewis-McChord, where they will be analyzed, officials said. 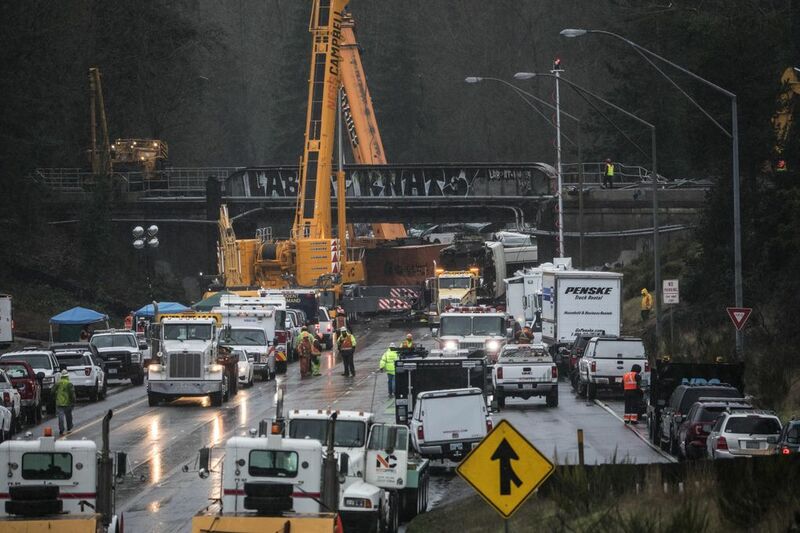 Officials warn of lengthy traffic delays and backups as long as 16 miles on detours as the southbound freeway, near Mounts Road outside of DuPont, Pierce County, remains closed for the cleanup. 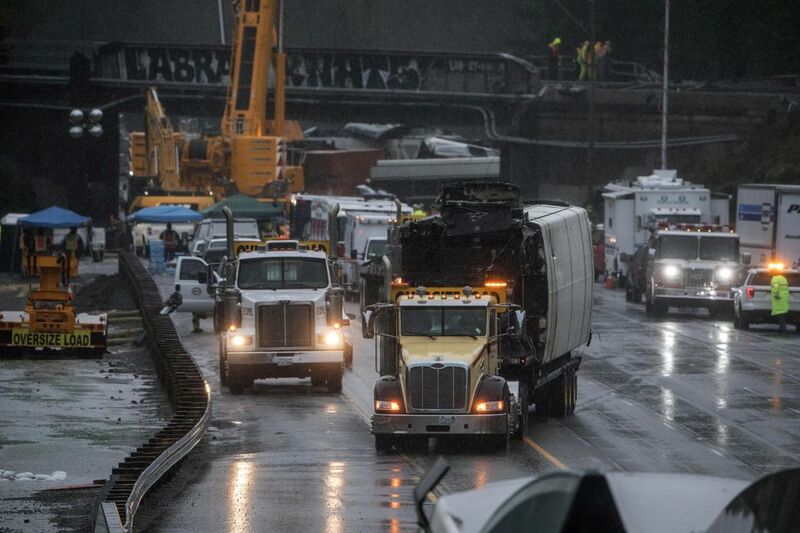 The southbound lanes of I-5 will remain closed at least through Wednesday morning, according to the Washington Department of Transportation (WSDOT). The closure of southbound I-5 lanes could last days, even through the end of the week, said Travis Phelps, a WSDOT spokesman. The roadway and rail crossing will be inspected for damage before allowing traffic to pass. Washington State Patrol Capt. Dan Hall said Tuesday morning that it’s a challenging job to clear the 12 train cars and the derailed locomotive from the area. 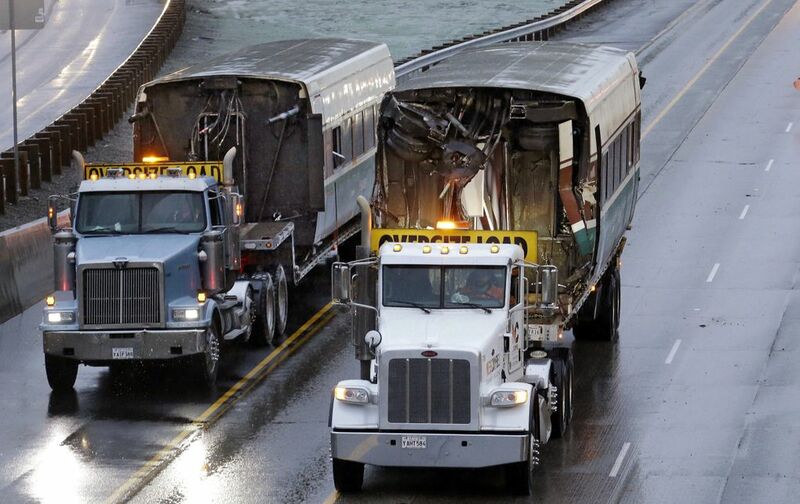 The locomotive alone weighs more than 270,000 pounds and required two flatbed trucks to move. Heavy rain made the job more difficult, he said. “We’re moving as quickly as we can, but making sure every one on scene is safe,” Hall said. Phelps encouraged everyone to avoid the area. The freeway closure has had a “regional effect,” causing severe backups, he said. 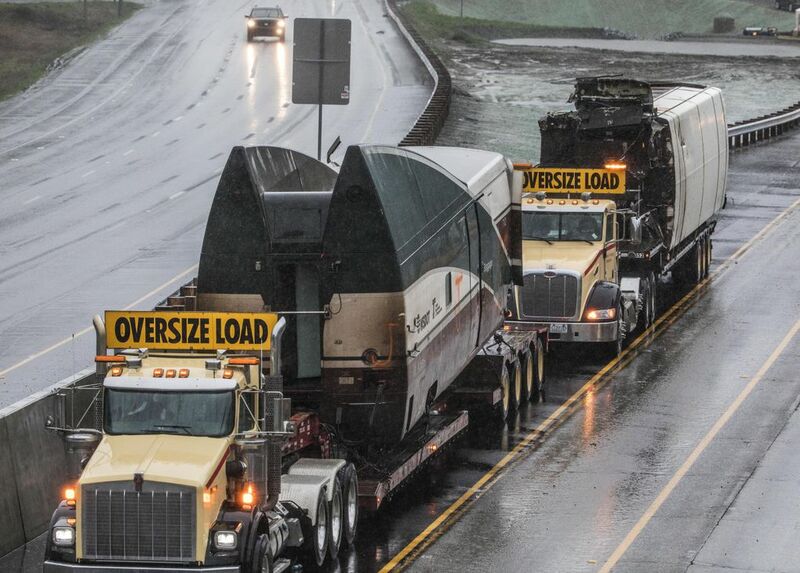 Highway 507, for example, which runs between Steilacoom and Yelm, had a 16-mile backup at times. Drivers should instead use Highway 16 or Highway 3 as alternative routes. Drivers taking detours should plan for delays and bring vehicle emergency kits — with supplies such as cellphone chargers, flashlights, batteries, first-aid kits, blankets, snacks, water and winter clothes — in case the wait is longer than expected, according to the Washington State Emergency Management Division. Follow @wsdot_tacoma for live traffic updates in the Pierce County area. Please be patient on commute south. No detour is equipped for I5 volumes. Expect congestion/delays. If possible, take any alternate route. 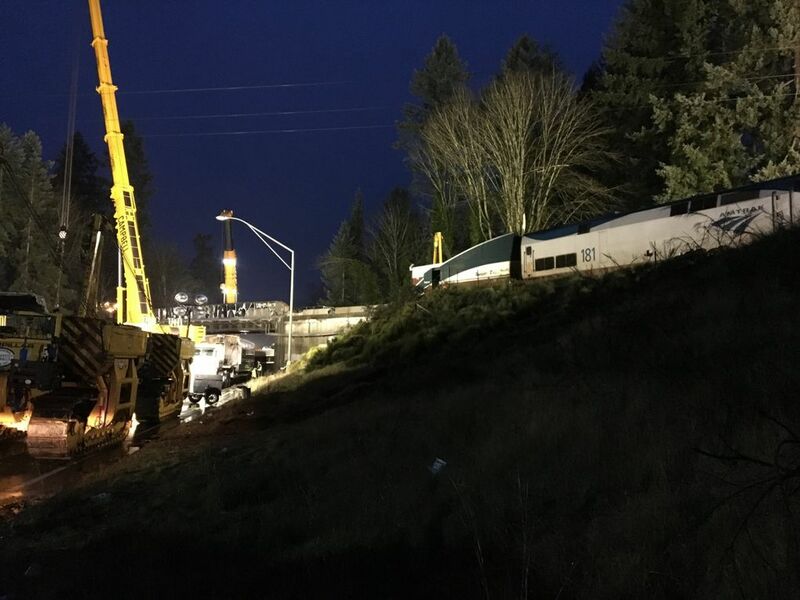 Monday’s Amtrak train derailment occurred on a rebuilt, $181 million passenger corridor that aimed to make the trip between Seattle and Portland more reliable. 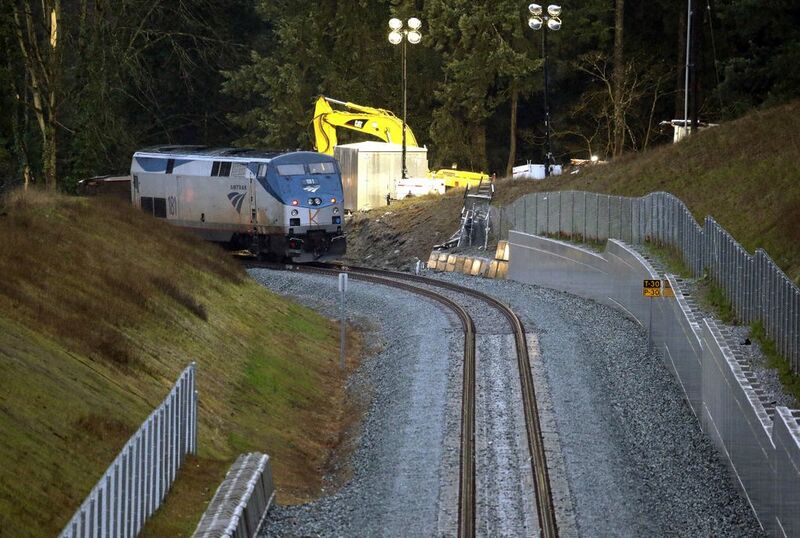 The train, with about 80 passengers and seven crew aboard, was supposed to slow dramatically before entering the curve where the derailment occurred. Aside from the dead, about 70 people suffered injuries ranging from minor scrapes to life-threatening wounds and were taken to various hospitals for treatment. At Harborview Medical Center in Seattle, for example, two male patients remained in serious condition in the intensive-care unit Tuesday. Two other victims, a male and female, were in satisfactory condition, according to hospital spokeswoman Susan Gregg. Nineteen victims, with injuries ranging in severity, received treatment at Madigan Army Medical Center on Joint Base Lewis-McChord’s campus. That is the largest number of victims at any one hospital in the area, due to its proximity to the crash site, according to a spokesman for the hospital. Four patients remained at Multicare Tacoma General Hospital and two at Multicare Allenmore Hospital, all with serious injuries. Survivors are sharing stories of how they escaped the scene — some of them were inside the derailed train cars — while witnesses are recalling how they rushed to help victims. One of the frontline responders was a 23-year-old Army officer from Oklahoma who had just arrived last month at Joint Base Lewis-McChord. Second Lt. Robert McCoy had finishing up morning exercises and was heading home to Lacey for a quick shower in his Dodge truck when he heard a loud noise. Looking ahead of him on I-5, he saw a concrete barrier along the trestle crumble, and a rail car break through, then hang off the side. McCoy says he initially focused on wounded passengers lying underneath the dangling train car that he feared might fall and crush them. Some he carried to safety, while he supported others who had trouble walking. Then McCoy climbed on an overturned train car to reach those inside the other car suspended off the trestle. One elderly woman was hanging outside the car, and he was able to get his arms underneath her and get her down. Then he entered the car, which had luggage racks broken and baggage strewn everywhere among the wounded inside. Many of the passengers insiders, though injured, were able to get out of the car under their own power. But not all. McCoy assisted a woman with a severe break in her leg. He also tried – unsuccessfully – to to pry open a jammed bathroom door where a father and young infant were trapped inside. Eventually they were rescued by rescue personnel who had an ax and crow bar to break down the door. McCoy said he stayed on scene for about three hours until finally getting back into his truck and heading back to this Lacey home. “I never expected to see anything like this on the civilian side,” said McCoy, whose unit is part of the 62nd Medical Brigade. 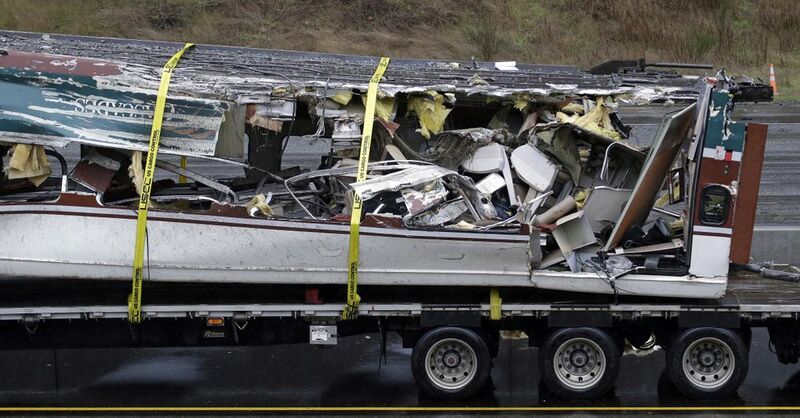 The U.S. Department of Transportation issued a statement Tuesday morning, saying it has asked senior advisor James Ray to go to the crash site in addition to a team of 15 experts from the Federal Rail Administration. Times staff reporter Hal Bernton contributed to this report. Christine Clarridge: 206-464-8983 or cclarridge@seattletimes.com; on Twitter: @c_clarridge. Jessica Lee: 206-464-2532 or jlee@seattletimes.com; on Twitter: @jessleeST.